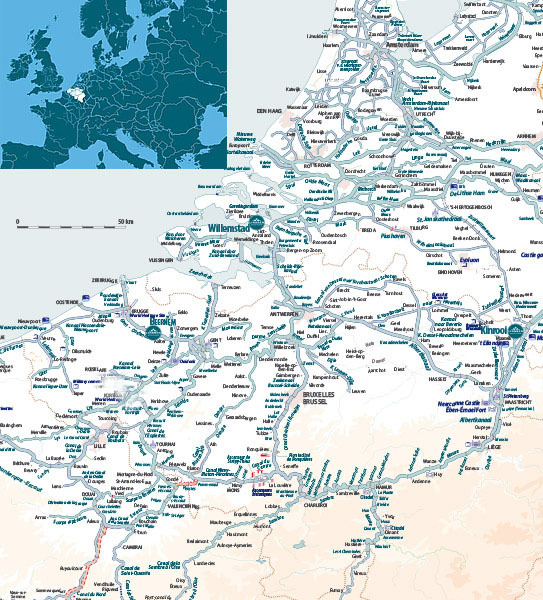 Nowhere in the world are so many historic, interesting towns and cities linked by waterways as in Belgium, northern France and the southern Netherlands. With the Linssen motor yachts which you can charter in the Belgian bases in Kinrooi near Maaseik in Belgium Limburg, Beernem near Bruge or in in Kuurne (Kortrijk), West-Flanders, you can combine relaxation with culture in a stylish manner, as you are close to cities such as Düsseldorf, Aachen, Amsterdam or Brussels. The peaceful waterways lead through beautiful countryside to well-known towns such as Brugge and Gent as well as idyllic spots such as Diksmuide, Oudenaarde and Veurne. Once across the Limburg Border Meuse, you reach the cities of Liège, Maastricht and Roermond. There you can visit interesting museums or just have a great time shopping in Maasmechelen, Roermond or Lille outlet centers. And of course you can also try out the restaurants and their culinary highlights, such as the uniquely abundant range of fantastic Belgian beers and chocolates. It‘s no coincidence that Belgians are referred to as bon viveurs.